On January 24, a press conference criticizing the incompetence of the Tuition Fee Revision Committee took place in front of the 4.18 Memorial Hall. 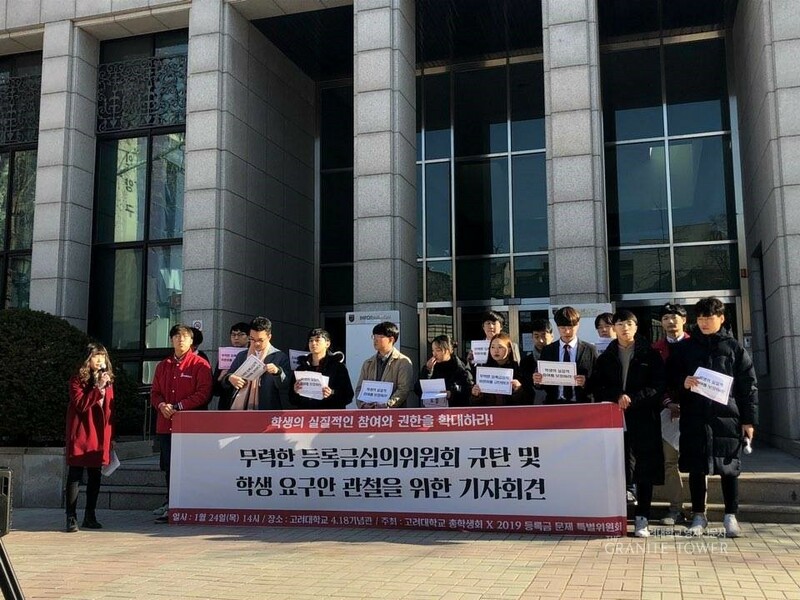 About 20 students attended the press conference to show how desperately Korea University (KU) students hoped for tuition policies that satisfy their needs. Throughout the press conference, the Student Union focused on the students’ requests that the 2019 Tuition Fee Committee failed to reflect. The requests included the increase of the corporation transfer money, prevention of overaccumulation of school foundation money, and transparency of overall budget regarding school laboratory fee. Such requests had been mentioned in the second and third conference regarding tuition operation this year. Yet, the school administration did not come up with any solutions to the problems that the students mentioned in the past conferences. They rather consistently avoided responsibility by stating that they “are not yet prepared” or such decision is “beyond their reach.” Whether the Tuition Fee Committee will successfully reach an agreement with KU students is an issue the student body should continuously keep an eye on.